The most exciting years of my life were absolutely those when I lived abroad in Japan, Slovakia and Germany. Being back home in Perth and having a gorgeous son is wonderful too, but living in foreign countries, experiencing the challenges of cultural and language barriers (and overcoming them), getting to see new sights, taste new foods and meet wonderful new people is hard to beat. When I heard my friend Lalla and her husband Adam were taking the plunge again, moving abroad again, but this time with their two young kids, I was both jealous and full of admiration. Like me, Lalla and Adam have spent time living abroad (in particular, in Thailand), then came back home, had kids, and their eldest is now in primary school. Also like me, they want to give their children a proper appreciation of the world and its different cultures, and they have packed up and headed off to Thailand for a couple of years. I’ve been so inspired by following their journey through Facebook that I asked Lalla to answer a few questions for me in the hope that their story will inspire other families to attempt these kind of amazing experiences too. Why did you move your family to Thailand, and why now? It’s a big move. The main reason we chose to do this while our kids are 6 and 3, is because it really is the right time and they’re the right age. We’d love for them both to be people of the world who appreciate diversity and also what they have. They now go to school with kids from a range of cultures but also see daily life on the streets of Bangkok. We often talk about who we chat with from market stall owners, to business people, to street kids. The questions that they ask and answers we give, often show just how much they are taking in on a daily basis and their understanding of cross cultural awareness. How did you prepare your kids for the move, and how have they coped? As soon as our 6 year old could understand, we’ve been talking about “when we live in Thailand”. We took holidays to the places we intended to be in later on. We bought kids’ books in Thai that became bedtime stories and even when it was a stretch, we ate out at Thai restaurants that we knew had mostly Thai speaking staff so food and cultural norms became second nature. As for school, we tried as best we could to talk up the positives of meeting new friends from all over the world while keeping the old. Even now, we have a whole class of pen pal letters from her old class to give to her new class mates. We also made sure both kids knew something about what to expect in Bangkok. There have been heart-wrenching moments for me, as the mum but in general, she gets over it faster than I do. I suppose in the big scheme of things, time is relative and I think kids move on and adapt quicker than we do. 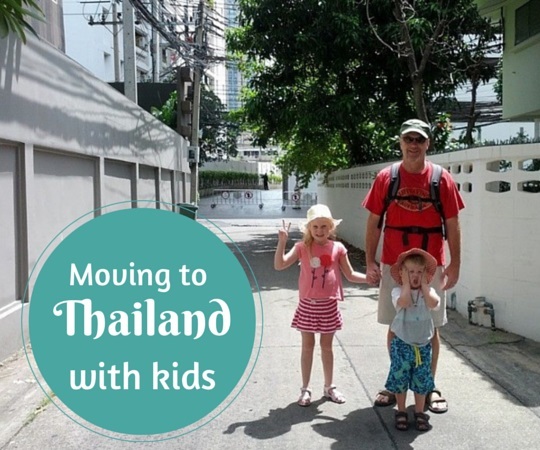 What to expect in Bangkok and what were the practical logistics of moving to Thailand with kids? The practical logistics of moving to Thailand with a family were by far the most frustrating but also the most exciting part. About a year prior, we had decided that either life in our current place needed a shakeup or it was time for a change that took us elsewhere. Just by making the decision together, we knew that we were sharing a common goal and were both looking forward to a place where each day hands you a surprise. Once the decision was made, the research began. I needed to know where my qualifications and experience sat amongst all other applicants to potential jobs. The city map of Bangkok sat proudly in a private spot on a wall in our house. It was our surreptitious plan that gave each of us a little pleasure if the routines of daily life got a bit too much. Until things were a little more real, I didn’t want to start answering questions or justifying it to anyone. Timelines were plotted, contact names were researched and websites of workplaces were scoured for the overall picture. By the time I had invitations for interviews, I knew quite a bit about most workplaces for which I was qualified. These interviews however only came about as I let them all know I would be in the city for a specific week and then followed up. My current boss was impressed with the initiative and as it turns out, is a great guy to work for. The school for the kids was a bit harder. International schools the world over cost quite a bit. You may be able to go down the road of local schools but need to think about the resettling back to your homecity later on. We decided that easing the kids back in to schools when we’re done was worth the cost of International School education. 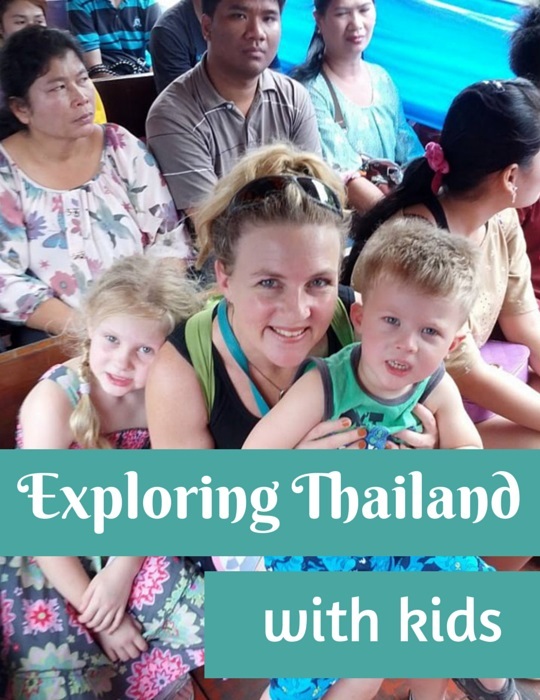 The school that your children end up in while you are expats also dictates where you will live for the most part so after some research into expat family life in Bangkok we realised we wanted to be around other families who had made the same decision. Where to live in Bangkok with family is another part that needed a fair bit of research. Thankfully visas haven’t been too hard. We have a wonderful woman at my work who is an expert in all things visa. She has given us some great assistance and advice and is worth her weight in gold. I recommend finding one of these people. The final hurdle was the house in Australia. Being a bit of a collector of many years, I can now successfully say I am cured of the serial purchasing of and the storing of junk. It took the full year to empty eight years of extraneous things from all shelves and cupboards of a 4 bedroom, 2 bathroom family house. Never again will I own so much additional, superfluous bamph. If it isn’t aesthetic or useful, it doesn’t even get to enter our apartment now. Partly because we don’t have the room for it, but mostly because the process was emotionally and physically exhausting. Anything we now own is in boxes and has only earned a place in storage because it cannot be replaced easily. There are no pots and pans, very few things from the linen cupboard and almost no items from the kitchen. Most can be bought nice and shiny new when we start again later. Now that is a good feeling. To sum up: Why should my readers travel more? You should never take life as just status quo and accept a routine that doesn’t inspire you at least some of the time. Set the example for your kids of the type of person you’d like them to be. Help them to learn how to adapt, accept others and take on new challenges. Yes, I won’t lie. It’s not always easy and sometimes even I think we’re mad for doing this, but for the most part, I’m watching my kids and my family grow through an amazing experience that has brought us all closer together. Over to the readers: Would you take your family to live in a foreign country? It sounds like a big step, doesn’t it? But Lalla and Adam have shown me, as others have before, that if you really want something, there’s always a way to do it. You could make the hurdles and logistics into reasons not to go, or you can find ways around them and follow your dreams. If you want to read how Lalla and her family have gone, you can read the follow-up post which Lalla sent to me a year after moving to Thailand with a family. I was lucky enough to visit Bangkok for a conference and meet up with Lalla and her husband again, and it sure sounded to me like expat family life in Bangkok was going swimmingly. 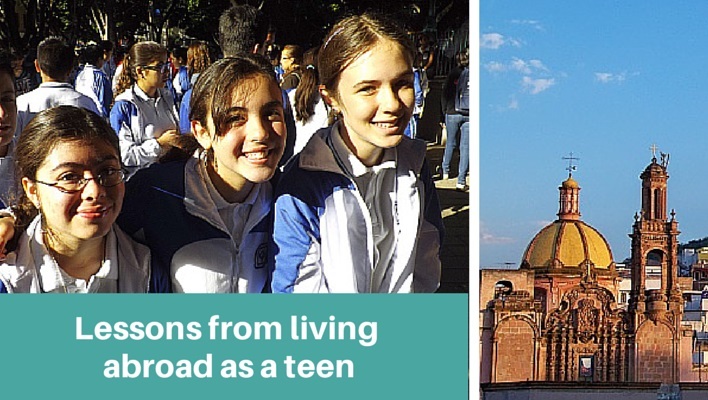 So what do you think – would you take your family to live in a foreign country? Great post, Amanda. While Donny and I don’t have kids, we always admire families like Lalla and Adam’s who are taking the plunge and moving with kids abroad. What a wonderful opportunity for all of them, but especially for the kids. Letting the kids become true world citizens, and develop an appreciation for different places, people and cultures is a very special gift. We look forward to hearing more about their adventure! Thanks for the comment Tamara – yes, it’s a fantastic opportunity for all of them. I’m very impressed! You’re right Tim – more and more families are trying this out, which I think is brilliant. I’ve followed your work for many years Tim – your new book sounds look a great way to help convince people to try this out. Good on you! I have been living on and off in rural NE Thailand for over a decade. My wife is Thai and we have two boys 7 and 10 years old. They have been brought up in Perth where I have my studio and gallery in Mount Helena. As the boys can’t speak Thai, three years ago we decided to spend one term each year in Thailand. So we take the boys off school and they go to school in Thailand for the last term. This is working really well and they are gradually learning Thai (its not an easy language for an English speaking person to learn). We bought a small guest house here on the Mekong River and I teach art while my wife looks after the guests. Its really ideal, I don’t like the big tourist centres but here there are few tourists, the culture is amazing and the people so very friendly. They always have a smile and a laugh. Thai people love children and the teachers here can be warm hug their pupils as there are none of the crazy restrictions we have in Australia, where our irrational fears mean there is no longer room for warmth in teacher children relationships. Jeremy, that sounds brilliant! What a great regular experience for your kids. So many benefits all round. I think I need to send Lalla and her family up to meet you guys! Kylie, that’s a very good question – I have no idea but I will put it out there to our Facebook community (Facebook.com/notaballerina) and I bet we’ll get you an answer! Kylie – some useful answers are now on our Facebook page! – click over to https://www.facebook.com/NotABallerina/posts/885020944894587 for some tips. It’s great to hear that you’re teaching your kids Thai by living there. Our kids are just starting to get the hang of ordering their own street food in Thai and they now know their ‘please and thank you s’ in all the right places. It’s so lovely to watch the positive reactions from the people they chat to. Our Thai buddies just love that we have committed to making sure they are comfortable and help out along the way so much too. How is it all going for you in The Issaan? I wish you, your wife and family all the best with the business and the teaching. It sounds like a great venture. I love the warmth of the teaching here too. My students regularly come in for a hug when things go well. It’s one of my favourite things that I really enjoy about teaching kids in Thailand. Thanks Tamara. I’m sure there will be some entertaining tales along the way. Thanks too Tim. We’ll be following your tips n hints too. My husband, i and our 2 yr old son are currently in the process of organizing a move from Perth to Thailand. Hopefully be there in a few months! I would be extremely appreciative of any hints and tips, in particular, moving costs and also am curious to know if Lalla has had any experience with Nannys/Housekeepers? How exciting Renee! In case Lalla doesn’t see this I’ll pass the message on and she can email you with some tips. Good luck and keep in touch! That’s very kind of you, cheers! Oh and yes, we are very excited! Great piece and I totally get where you are coming from. We upped stumps and moved to China with our four year old last year. (She was born in Hong Kong). It’s been a huge change and sometimes (actually plenty of times) we think we are mad…..but the adventure aspect is huge. Every day is a challenge for us all and when we eventually return to Australia, these memories will live on forever. Congratulations and enjoy every step, even the steep ones. I think thinking you are mad is a really good sign, Nicole! That makes life much more interesting and definitely creates all kinds of stories you’ll remember as a family forever. Good on you! Such an inspiring article! I’ve been thinking about moving abroad with my family, but we’ve never had quite the courage, there was always something… you know how it is. 😉 But now our three little once are 6, 5 and 2 years old and things like your post give me hope that this lifestyle is really achievable! Thank you so much for sharing! It really is, Chrissy! I’ve got a follow-up interview with Lalla coming up next month, now that they’ve been there close to a year, so watch out for that. But yes – you can do it!! Aisha – I will have Lalla on the blog again soon so will see if I can find out from her! I want to teach abroad but not sure what lind of Visas my husband and kids could get…help! :) He would be homeschooling them in Thailand. Good question Kristin, I’m not sure. I’ve got another post with Lalla coming up (today!) so hopefully she’ll be around on Facebook to ask this one. I guess they sorted this out somehow! If you’re a qualified teacher and you get a job with a good school, your husband and kids are the ‘dependents’ and they have their own ‘dependent visa’ that is attached to your work visa. It doesn’t enable your husband to work legally in Thailand but if he has his own work interests that pay into your home account, then this is okay. I suppose it just depends how well you are paid or how portable your partner’s work interests are. If you can score a job that keeps you all, you’ll be fine. If you can also work it so that you’re both bringing in family funds somehow, that’s also another way to make it work. Good luck with it. I wish you well and hope that you can make it happen. Thank you for this post! It’s very inspiring and a great luck to find exactly an article about moving to Thailand, also from somebody who has moved and lives there. My husband and I are planning our move for the beginning of the next year and we are thrilled and impatient as much as our kids are. Reading your article makes me feel glad we made our decision. Thank you for sharing your experience! It’s one of the most exciting decisions you can make and has been so good for us and our family. May the adventure for you all begin well! My husband and I are both elementary teachers in the US. We have two small boys (1 and 3 years old). We have been presented with an interesting offer to potentially work in an international school in Bangkok. 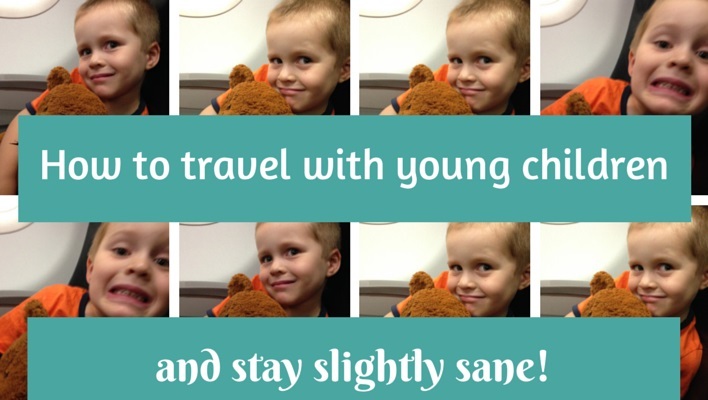 We both love to travel and would love to expose our small boys to different cultures. Any specific information we should consider while making this decision? Both pros and cons? Really insightful and very helpful 🙂 Thank you. I’m a single mum to a 6 year old, we live in the UK. I would love to teach English abroad. I am currently looking at holidays to Thailand just to learn a bit more about the culture and different schools ect before we would do some long term travel there. My only problem is I don’t think I could afford the international school fees for my daughter there? Was it very expensive? Hi Tania, it would be a fantastic experience, wouldn’t it! You would have to look around at the schools I think because I remember Lalla telling me that they are pretty expensive in Bangkok. But do some research anyway!